The semi-finals of the 2018 New Voices Awards were held at the WCCA TV studio on November 20, 2018. We had many talented singers who performed extremely well in front of the judges, lights and cameras. Our three judges, Amanda Carr, Cliff Goodwin and Victor Infante, were impressed with each singer and had the difficult task of selecting the five contestants who would move on to the semi-finals. The auditions, semi-finals and the final performances of the New Voices 2018 will air soon on WCCA TV, Channel 194 in Worcester, also streaming live on www.wccatv.com. Stay tuned to find out who the winner is! These young voices will leave you in awe with their incredible talent!! Be sure to follow us on Facebook or Twitter. On Instagram, we are wccatv13. 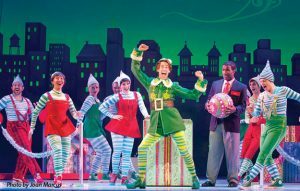 WCCA TV’s Executive Director, Mauro DePasquale, interviews Buddy The Elf at The Hanover Theatre to promote Elf the Musical happening November 29 through December 2 at the Hanover Theatre in Worcester. Following the interview, Buddy helps spread Christmas cheer with the carolers and the crowd as the trees are lit outside the venue. It’s beginning to look a lot like Christmas!! things going on in Central Massachusetts. Host of the program, State Senator Harriette Chandler, welcomes Karen Duffy, the President and CEO of the Worcester Credit Union. In another episode, Senator Chandler welcomes Dennis Lipka the interim administrator of the WRTA. This Is Worcester is a WCCA TV program, hosted and produced by community activist Bill Coleman. The program focuses on interesting Worcester area facts and history. Bill talks about Worcester becoming a town in 1722. What is going on at Holy Cross? Tune in to this episode of Rosen’s Round Table to find out. In another episode, host Gary Rosen and his panel members talk about the controversial images on the bathroom doors of a Worcester restaurant and the reaction of social media. Know Your Rights is a WCCA TV show to inform viewers of their civil rights, hosted by Ron Madnick. Ron talks about The New Supreme Court. In another episode, Ron gives an analysis of the last election. Connecting The Dots is a non-traditional legal program with the emphasis on the attorney as a trusted advisor, with an interdisciplinary approach to solving life’s issues. Host of the program, Liz Myska, talks with Scherrie Keating about diabetes. In another episode, Liz talks with Amy Finke from Lifeway Mobility. What It’s Worth is a WCCA TV program definitely worth watching! In this episode, host Tommy Colletta chats with Jonathan Graeme McCullough, the head of music at All Saints Church. Human Touch is a new WCCA TV program to spotlight refugees and to learn about their struggles, their stories, their challenges and triumphs, in order to bring about understanding and change. Host Augustine Kanjia talks about understanding the Plight of Refugees. Perspectives, with Asima Silva, is a WCCA TV show that features local and national guests sharing their perspectives on politics, current events, mental and emotional health, as well as religion. Asima talks with with Vivian Li, the Curator of Asian Art at the Worcester Art Museum. 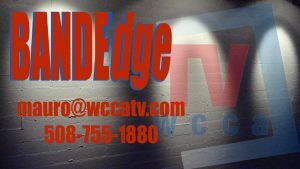 Band Edge is a WCCA TV produced local-music show that is shot live, spotlighting Worcester area bands, solo singer/songwriters, and instrumentalists. Scott Michael Olson is the featured artist on this episode of BandEdge. 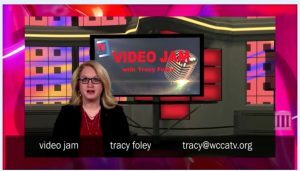 WCCA TV’s independent music-video show, Video Jam, hosted by Tracy Foley, has a Holiday Special that will feature Christmas music-videos from Eric Clapton, Timothy Craig, For King and Country, Sherry Lynn, Joanna Yaeger, The Nickel Slots, and Victory. Happy Holidays!! Spend an hour enjoying the latest and greatest in country music by tuning in to Video Jam Country with host Tracy Foley. This special episode will feature an interview with country music artist Houston Bernard and also his live performance at the WCCA TV studio of four songs – Wait for It, We Made Out, Never Grow Old, and What a Man Should Do. Exclusively on WCCA TV, Channel 194 in Worcester!! * Senior Speak is a program by WCCA TV in collaboration with the Worcester Senior Center. Senior issues are discussed and a good time is had by all. Senior Speak is recorded at the Worcester Senior Center, located at 128 Providence St., on Tuesdays at 2 PM. Stop by and be a part of the show! Ben Alotey, one of WCCA TV’s longest active producers, is the host of Ben Behind the Scenes — a show featuring music videos, interviews, reviews, and short films. Tune in to another episode of pure entertainment. WCCA TV, Channeling Worcester Community Since 1986! This entry was posted in Circle of Friends, Classes and Workshops, Community, Events, Mauro, News, Public Access and tagged City and neighborhood news, Community Media, Events and Information, fun, Local News, Mauro DePasquale, media democracy, media training and workshops, Public Access, Soapbox, wcca tv, wccatv.com, Worcester Local, Worcester news, Worcester TV on November 29, 2018 by mauro. WCCA TV NEWSLETTER : IT’S ALL HAPPENING AT WCCA TV ! Hello friends! Happy Fall! There are many new programs and projects going on at WCCA TV this time of the year, but our focus is on the New Voices Awards competition, which is taking place on October 30, 2018 at the WCCA studio. 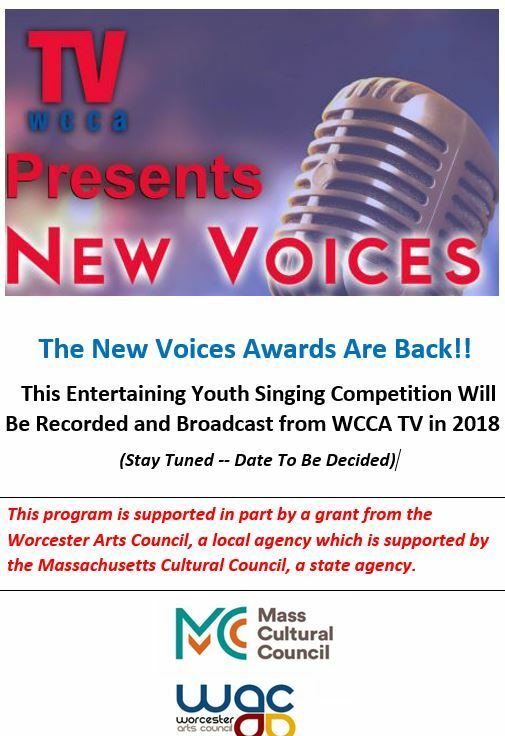 All singers between the ages of 13 and 21, please contact Michael at WCCA TV for an application by sending an email to michael@wccatv.com or calling 508-755-1880 ext. 119. Come on down and sing your heart out!! WCCA TV was at the Worcester Red Sox Celebration on the Worcester Common Oval on Monday, September 17th. The ceremony featured appearances by legends of the Boston Red Sox baseball club as well as players from the Pawtucket Red Sox. The WooSox Celebration was recorded by the WCCA TV volunteer Jeremy Johnson. This WCCA TV special presentation features an interview with disability advocate, attorney Liz Myska. WCCA TV’s crew was at Clark University in Worcester to record a lecture by Nancy Rosenblum. 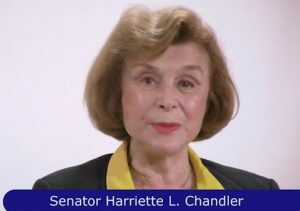 Sabrina Bohun, Director of Mediation at The Family Services of Central Massachusetts, recently appeared on the WCCA TV program Beacon Hill Chat hosted by State Senator Harriette Chandler. 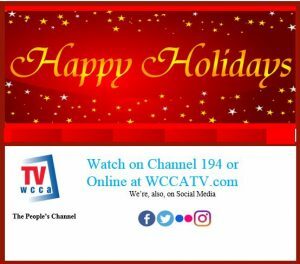 That’s what they had to say about WCCA on their social media page: ”Thank you to WCCA TV 194 ‘The People’s Channel’ and staff (Producer Bill Hamilton and Administrative Assistant Zara Dedi) for making this such a memorable experience.” We look forward to future collaborations with them and other non-profits in the area! things going on in Central Massachusetts. Host of the program, State Senator Harriette Chandler, welcomes Kathleen Gagne, the Vice Director and Chief Development Officer of Mechanics Hall. Did you kow that Main Street from Federal Square to Lincoln Square in Worcester will be getting a facelift? Watch this episode of Rosen’s Round Table hosted by City Councilor Gary Rosen, to learn more about it. In another episode, Rosen and his panel members talk about the Worcester Red Sox Project. Activate Worcester, hosted by Ron Motta, is a WCCA TV program that shows viewers how to participate and become active in Worcester. Ron welcomes Chanel Prunier to explain why people should vote NO on Question 3 on the November ballot. Know Your Rights is a WCCA TV show to inform viewers of their civil rights, hosted by Ron Madnick. In this episode, Ron talks about The Story of the Bill of Rights: Students Rights. Connecting The Dots is a non-traditional legal program with the emphasis on the attorney as a trusted advisor, with an interdisciplinary approach to solving life’s issues. Host of the program, Attorney Liz Myska, welcomes Robin Norton, CFA. Ramona Pokoly is the host of Ramona Interviews, a talk show that features interesting guests from all walks of life. Ramona’s guest is Jacob Sanders to talk about canibus coming to Worcester. In another episode, Ramona’s guest is Matthew Flynn to tell us about his incredibly journey. Hidden Treasures is a WCCA TV program that helps you learn how to find that hidden antique or collectible that just may add cash to your life. Host Bill Safer and his guest, auctioneer/appraiser Wayne Tuiskula, talk about the world of auctions. Human Touch is a new WCCA TV program to spotlight refugees and to learn about their struggles, their stories, their challenges and triumphs, in order to bring about understanding and change. Host Augustine Kanjia tells us his own story. This Is Worcester is a WCCA TV program, hosted and produced by community activist Bill Coleman. Bill talks about the history of black elected officials across the country, with a focus on Massachusetts U.S. Senator Edward W. Brooke. In another episode, Bill talks about the City Seal and the Mosaic Project. Perspectives, with Asima Silva, is a WCCA TV program that features local and national guests sharing their perspectives on politics, current events, mental and emotional health, as well as religion. Asima welcomes Edina Lekovic. Time for a coffee break and another episode of Coffee with Konnie. Join City Councilor Konnie Lukes and her guests as they discuss city issues at Worcester area coffee shops. Konnie has coffee with Rob Baumann. Health Matters is a program from the Worcester District Medical Society. Host Dr. James Broadhurst welcomes Dr. Mark Neavyn to the show. The topic of discussion is Public Health Implications for Marijuana Deregulation. Because your health matters! Video Jam is your source for eclectic music videos. Your favorite host, Tracy Foley, has been presenting mainstream and indie rock for more than 10 years on cable TV public access stations. Today’s Playlist features: Darrell Kelley – Unity, Big Sam’s Funky Nation – Pokechope, Kyla Imani – Sitting Up in My Room, SJ Armstrong – Some Restful Day, Shane Palko – Don’t Fall in Love While Time Traveling, Harp Samuels – Fire, and more. Keep jammin’ with WCCA TV! Senior Speak is a program by WCCA TV in collaboration with the Worcester Senior Center. Senior issues are discussed and a good time is had by all. Senior Speak is recorded at the Worcester Senior Center, located at 128 Providence St., on Tuesdays at 2 PM. Stop by and be a part of the show! Nuestra Esperanza is a Spanish-language religious program hosted and produced by Lucy Tomey. This program has been airing on WCCA TV since 1990! Programación christiana de inspiración en Español, de mas larga duración en WCCA TV desde el año 1990, anfitriona y productora Lucy Tomey. This entry was posted in Classes and Workshops, Community, Events, Mauro, News, Public Access and tagged City and neighborhood news, Community Media, Events and Information, fun, Local News, Mauro DePasquale, media democracy, media training and workshops, Public Access, Soapbox, wcca tv, wccatv.com, Worcester Local, Worcester news, Worcester TV on October 1, 2018 by mauro. The WCCA TV Newsletter IT’s ALL HAPPENING AT WCCA TV ! This entry was posted in Classes and Workshops, Community, Events, Mauro, News, Public Access on October 1, 2018 by mauro. This entry was posted in Classes and Workshops, Community, Courses, Events, Joseph, Mailing List, Mauro, News, Public Access, Shows, Website, Workshops, Youth on March 30, 2018 by webmaster. Without Your Help, The Community Connections Program for Underprivileged Youth May Be Cancelled! Your Contribution Can Help Us Save The Program! This entry was posted in Classes and Workshops, Community, Courses, Events, Joseph, Mailing List, Mauro, News, Public Access, Shows, Tracy, Website, Workshops, Youth on March 28, 2018 by webmaster. This entry was posted in Classes and Workshops, Community, Events, Joseph, Mailing List, Mauro, News, Public Access, Shows, Tracy, Uncategorized, Website, Youth on March 26, 2018 by webmaster. 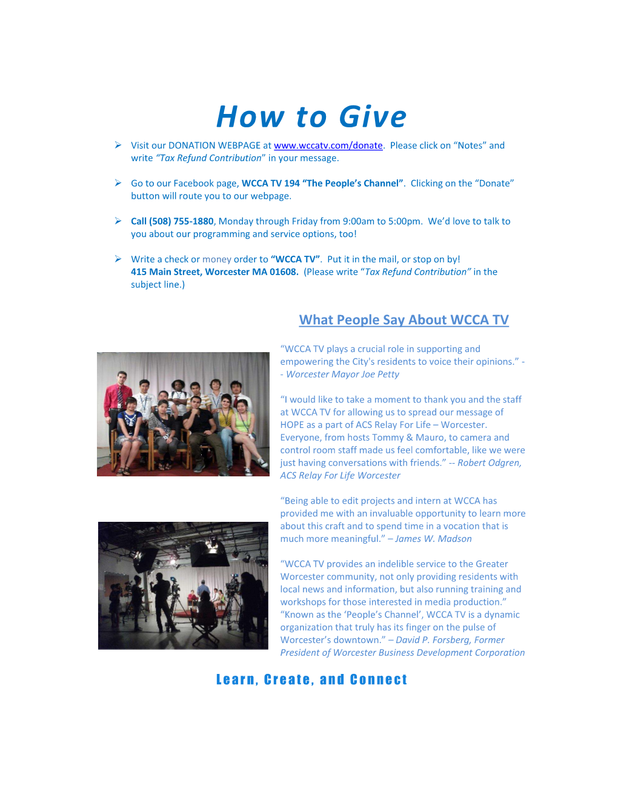 WCCA TV is a community media center that stands for media democracy and creative innovation. 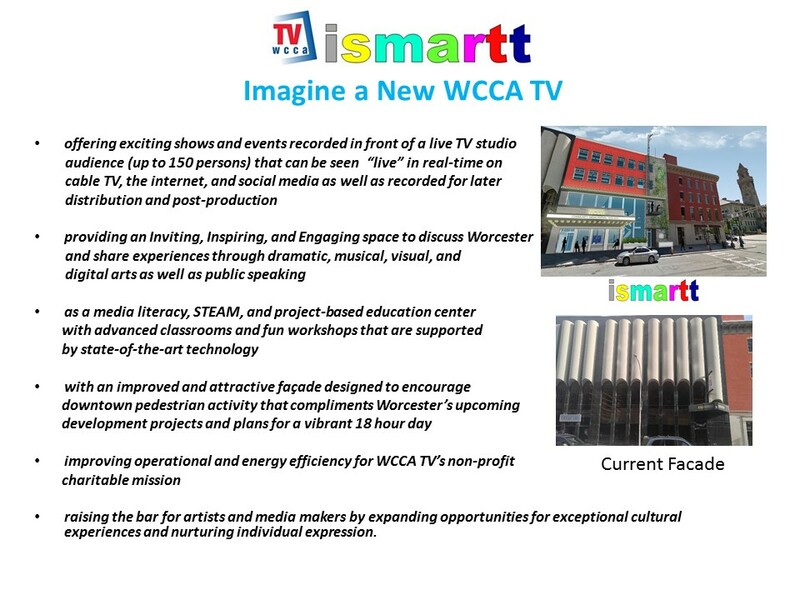 Located in the hub of downtown and the Theater district of Worcester, WCCA operates as a community TV production house and a school for communications technology, journalism and video arts, offering opportunities and training for Worcester people of all incomes. This summer we hope to have another youth program for underprivileged youth in our community, but the funding that used to pay for that annual program, unfortunately has been cut. We need your help to keep it going in 2018, while we search for a sustainable way to pay for the Community Connections youth program for underprivileged youth in 2019 and after. Please consider sending a donation to support the continuation of our Youth Summer Program by going to the following link on our website: www.wccatv.com/donate or calling us at 508-755-1880. Donations may also be mailed to WCCA TV, 415 Main St., Worcester, MA 01608. Please state that your donation is for youth programs. As always, thank you for your support! In other related news, WCCA TV’s popular New Voices Awards will be back in 2018 thanks to the support of the Worcester Arts Council and the Massachusetts Cultural Council. We look forward to discovering an promoting the young talent of Worcester! Our next TV Production Class starts on March 17 and is held at the WCCA TV studio, in downtown Worcester. This class is a MUST for all aspiring TV producers, as it provides useful information about all components of the TV production process. The class is offered on a first-come-first-serve basis. To reserve your seat, call 508-755-1880, ext. 14. Embark on your exciting TV Production journey today! Did you know WCCA TV also offers “One on One” instruction on Video editing? Members have an opportunity to take this special 2 hour class for only $150. Sign up today. Our Adobe Premier Suite is a powerful tool use in both Television and Film making industry. 508-755-1880 ext 110 to sign up. WCCA TV, in partnership with Mechanics Hall, presents Hops & Harmony at the Hall – a fun night of live music with audience participation at Mechanics Hall in Worcester. On the night of February 12, audience members learned how to sing “Call Me Maybe” by Carly Rae Jepsen. Guest artists were Matty B. and Amanda Carr. Hops & Harmony is supported by Atlas Distributors, Bay State Savings Bank, and Harvard Pilgrim Health Care. Exclusively on WCCA TV, now seen on cable Channel 194 and steaming live online at www.wccatv.com . WCCA TV is a media sponsor of the Worcester Earned Income Tax Credit Coalition. Our crew attended their press conference on the Tax Service Kick-Off 2018, which has been posted on our website. Mass Cultural Council; Consulting hypnotist, Peter Gagliardo, to tell us about Improving Through Hypnosis Center, and State Representative Mary Keefe. 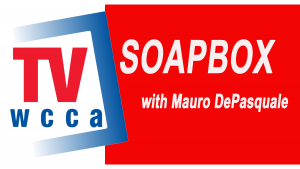 Soapbox can be seen on WCCA TV, Channel 194 in Worcester, and streaming live online at wccatv.com, on Saturdays at 10:30 pm and Sundays at 6:30 pm. To be a guest on the show, contact tracy@wccatv.org. things going on in Central Massachusetts. Host of the program, State Senator Harriette Chandler, welcomes the Treasurer of the Commonwealth of Massachusetts, Deborah Goldberg. What’s the city of Worcester doing about underage drinking? Watch this episode of Rosen’s Round Table to find out what host Gary Rosen and his panel members have to say on this matter. Time for a coffee break and another episode of Coffee with Konnie. Join Konnie Lukes and her guests as they discuss city issues at Worcester area coffee shops. Konnie chats with some students at WPI, who recently attended a City Council meeting, about sustainability. Activate Worcester, hosted by Ron Motta, is a WCCA TV program that shows viewers how to participate and become active in Worcester. Ron welcomes Mike Bottos to the show. Know Your Rights is a show to inform viewers of their civil rights, hosted by Ron Madnick. Ron talks about America’s Secret Government: The NSA. In another episode, Ron talks about The FISCA Court. Perspectives is a WCCA TV program that features local and national guests sharing their perspectives on politics, current events, mental and emotional health, as well as religion. Host of the show, Asima Silva, talks with the author of P For Palestine, Dr. Golbarg Bashi. In another episode, Asima welcomes [Tahirah Amatul-Wadud] (http://www.wccatv.com/video/perspectives/PERSPECTIVES15). In the House is a show to inform viewers about the ins and outs of real estate, home buying and other housing issues. Host George Russell’s return guest is Diego Ciccarelli to tell us more about mortgages. Exposure With Mosher is a WCCA TV show that spotlights entrepreneurs, innovators, and good news. Host Amy Mosher Berry welcomes Bobby Pagen, Founder of Red Flag Productions, actress Jamie Braddy, and Adam Masnyk, Founder and Producer of ‘Another Theory Productions’. The topic of discussion is the Indie Film Scene in Massachusetts. In another episode, Amy welcomes Sheryl White, founder of ‘Baby Kneads’, and Joelle Gilmore, Co-Creator of The No Drama Mamas podcast. Club’. The topic of discussion is Summer Youth Programs in Worcester. Healthy Bodies, Healthly Minds is a collaboration with the SHINE Initiative to raise awareness on mental health challenges facing youth. The SHINE Initiative and its Executive Director, Paul Richard, welcome Amy Ebbeson, Instructor of Social Work at Wheelock College. Static Fusion is an alternative performance art and musical variety program produced with the facilities of WCCA TV. The show is put together by the creative genius of Jim Racicot and Uncle Allen. Jim takes us for a tour of some of the POW WOW artwork in Worcester and then to hear The Freewheelin’ at the Birch Tree Bread Company. Video Jam is your source for eclectic music videos. Your favorite host, Tracy Foley, has been presenting mainstream and indie rock for more than 10 years on cable TV public access stations. Today’s Playlist includes: Nya – Mania, Shane Palko – Staring Out the Window, Shane Palko – Don’t Fall in Love While Time Traveling, Mercy Me – I Can Only Imagine, Panda$ – Paris, Johnnie Mikel – Come with Me, Rausch – Greener Grass, and more. Keep jammin’ with WCCA TV! Tune into Video Jam Country and spend an hour enjoying the latest and greatest in Country Music, with host Tracy Foley. This show will feature: Krystal Keith & Lance Carpenter – Anyone Else, Nick Brennan – I Want a Girl, Levi Hummon – Stupid, Levi Hummon – Love Heals, Robert Stowell – I’d Die for You, Sandra Lynn – Hey California, Cash Campbell – Cannonball, Cash Campell – Don’t Wanna Think About It, Anthony Orio – Undeniable, Melaine Meriney – Life Boat, Mo Pitney – Clean Up on Aisle Five, Olivia Lane – Devil and You, Tracy Lawerence – The Good Old Days, Jerod Nieman – I Got This, Aaron Watson – Outta Style, Little Feather – Hillbilly Love Song, Indigo Summer – Want What It Wants, and more. Shout-out to all Country Music fans!! Ben Behind The Scenes is a WCCA TV program that showcases music videos, interviews, reviews, and short films. The show is produced and hosted by Ben Allotey, one of WCCA TV’s longest active producers. Tune into another episode of pure entertainment. This entry was posted in Classes and Workshops, Community, Events, Mauro, News, Public Access and tagged City and neighborhood news, Community Media, Events and Information, fun, Local News, Mauro DePasquale, media democracy, media training and workshops, Public Access, Soapbox, wcca tv, wccatv.com, Worcester Local, Worcester news, Worcester TV on February 28, 2018 by mauro. The following testimonial is from Dee Wells (a professional Photographer and Filmmaker) about how WCCA TV helped him in pursuit of his career. WCCA TV offers opportunities and training for people in Worcester of all incomes. This summer we hope to have a youth program for underprivileged youth in our community, but the funding that used to pay for that annual program has been cut. We need your help to keep it going this year (2018) while we search for a sustainable way to pay for the Community Connections youth program for underprivileged youth in 2019 and after. Please send a generous donation by going to the following link web address: www.wccatv.com/donate or calling during office hours M-F at 508-755-1880. Donations may, also, be sent to WCCA TV, 415 Main St., Worcester, MA 01608. Please state that your donation is for youth programs. Dee Wells of Future Focus Media Explains How WCCA TV Training Programs Helped Him in His Career Path. Please take just 1 minute and listen! 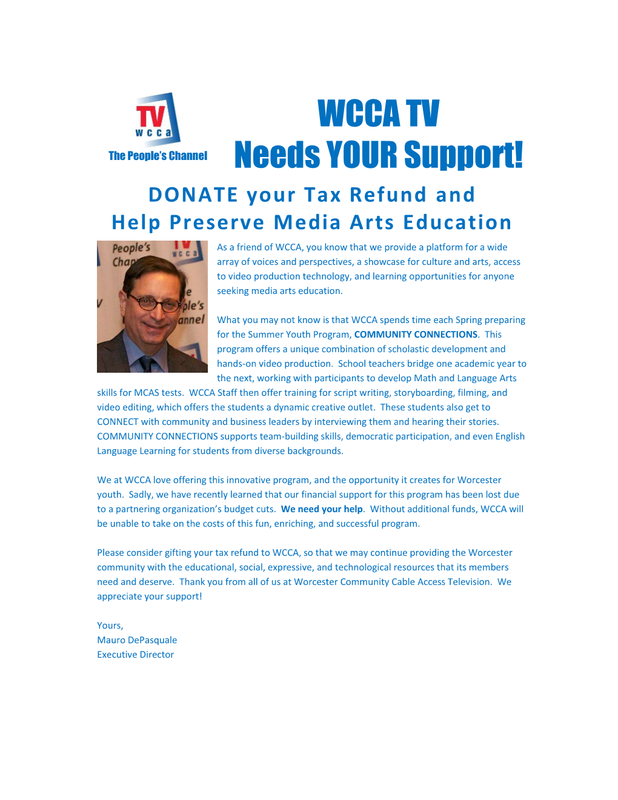 To Donate to WCCA TV push the donate button on our Facebook page or go to www.wccatv.com/donate. Also, you can call 508-755-1880 and make a donation or mail us a donation to WCCA TV 415 Main Street, Worcester, MA 01608. This entry was posted in Classes and Workshops, Community, Courses, Events, Joseph, Mailing List, Mauro, News, Public Access, Shows, Tracy, Website, Workshops, Youth on February 25, 2018 by webmaster. You Can Help Create the iSMARTT Center! 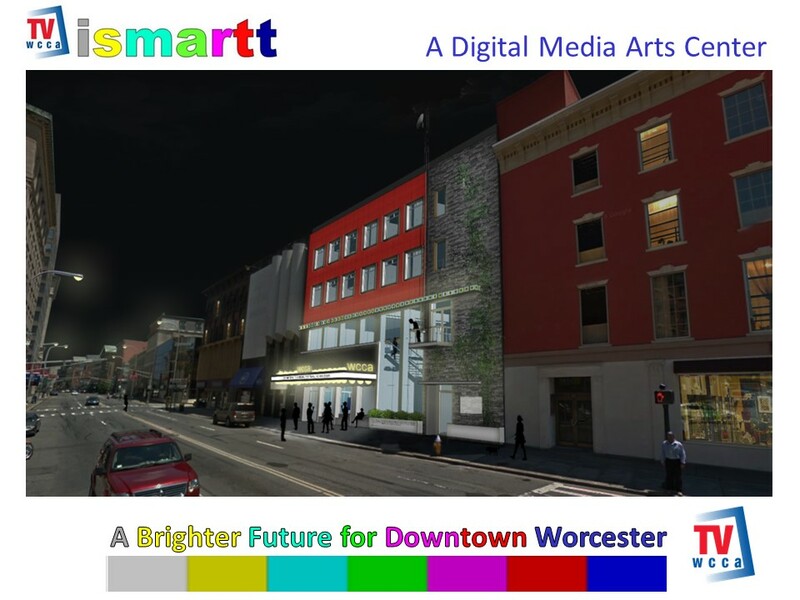 WCCA TV is Seeking Your Assistance in Bringing A Brighter Future for Downtown Worcester through the iSMARTT Center Project — Please Make a Donation — If you’re interested in volunteering for our capital campaign please contact Joseph at 508-755-1880 or joseph@wccatv.com . This entry was posted in Classes and Workshops, Community, Courses, Events, Joseph, Mailing List, Mauro, News, Public Access, Shows, Tracy, Website, Workshops, Youth on February 16, 2018 by webmaster. The New Voices Awards Are Back in 2018!!! This entry was posted in Awards, Classes and Workshops, Community, Events, Joseph, Mauro, News, Public Access, Shows, Tracy, Website, Youth on January 22, 2018 by webmaster.